Welcome to the online SwissRidge Hall of Fame! 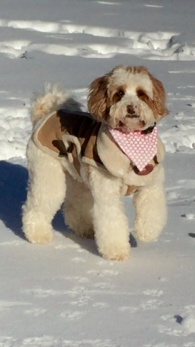 My goals for this page are simple: a) to profile the accomplishments of SwissRidge owners with their dogs; and b) to entertain! Many SwissRidge owners work with their dogs to achieve therapy designation. This makes me extremely happy, as it proves how well these clever, calm companions adapt to any situation. 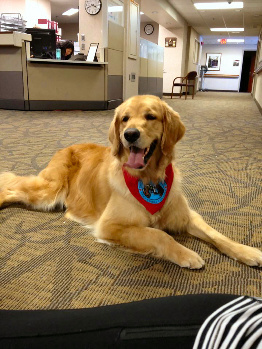 Trained therapy dogs often visit hospitals, schools or senior’s residences, for example, to spread some doodle cheer. 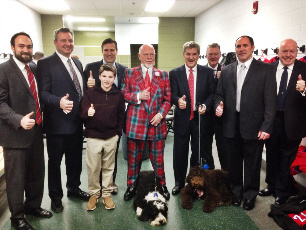 Marlee, owned by Carolyn Karle, was certified as a therapy dog by St. John’s Ambulance. 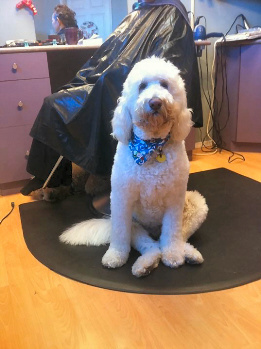 A standard English Goldendoodle, Marlee has been well socialized in Carolyn’s hair salon and is now putting her skills to work in the community visiting seniors and generating support for food drives. 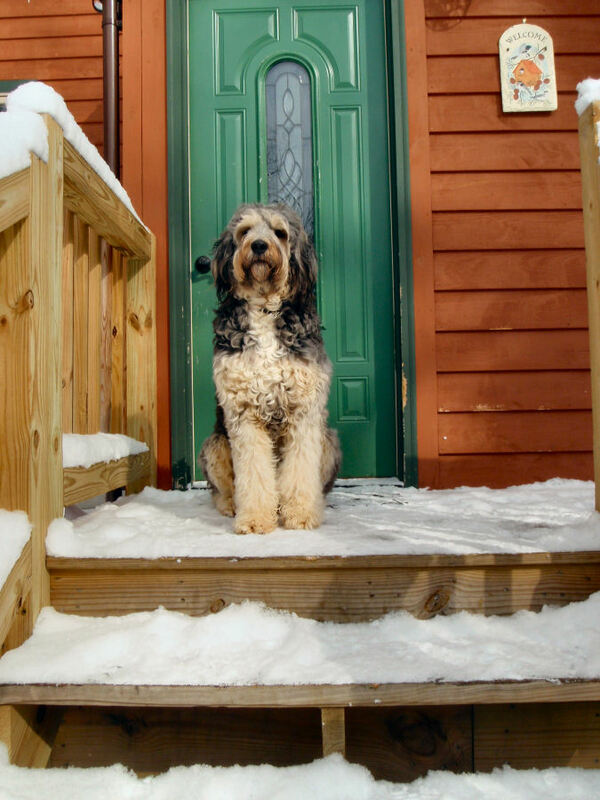 Motley, a mini Bernedoodle owned by Jamie Amell, was certified as a Canine Good Neighbour. He puts smiles on residents’ faces at his local nursing home. 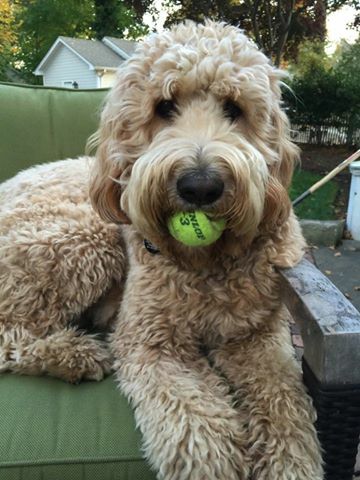 Ellie, a Goldendoodle owned by Kat Hamel, has been a registered therapy dog with Therapy Dogs International for several years. Ellie is also a part of Canine Inspired Change which is a therapy dog non-profit in Saint Paul, MN. Ellie and Kat visit the chemical dependency unit at St Joe’s hospital every week, as well as an elementary school to work with at-risk kids. They also visit with people who are recovering from traumatic brain injuries, and autistic young adults. Cobham, a standard Goldendoodle owned by Laurie Catizone-Jordan, is certified with Pet Partners and visits the elderly. Braidie, a tiny Goldedoodle owned by Mari Ann Spoelstra, is certified by The Bright and Beautiful Therapy Dogs Inc., and visits nursing homes and hospitals. Braidie—a high achiever!—also earned the Canine Good Citizenship award. 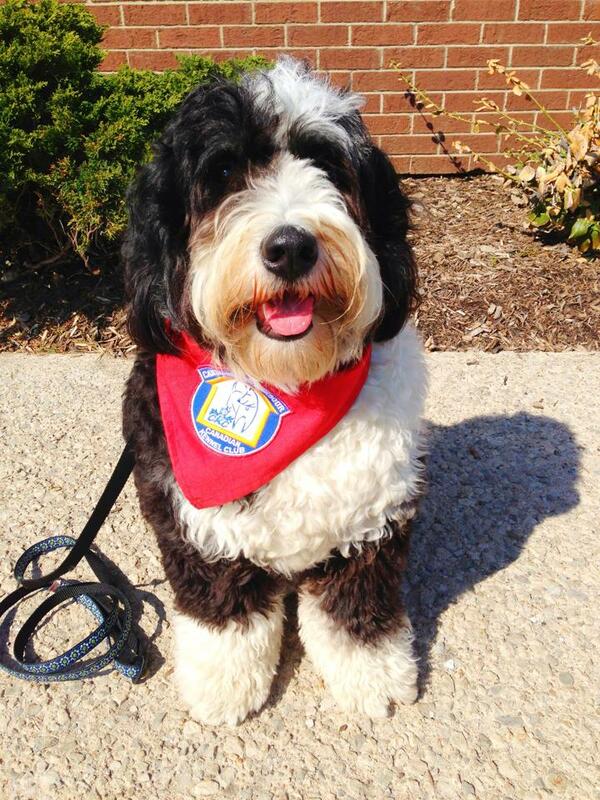 Gizmo, a standard Bernedoodle owned by Doreen Alessi-Holmes, earned his Canine Good Citizenship award. On a lighter note, I often hear about my dogs mixing and mingling with people who are in the public eye. Some are even owned by public figures. I thought it would be fun to share some of the photos I’ve received of SwissRidge dogs with movers and shakers. If you have more, place share them with all of us in the virtual Hall of Fame. Motley and Vedder, owned by Jamie Amell, working the Hollywood angle. 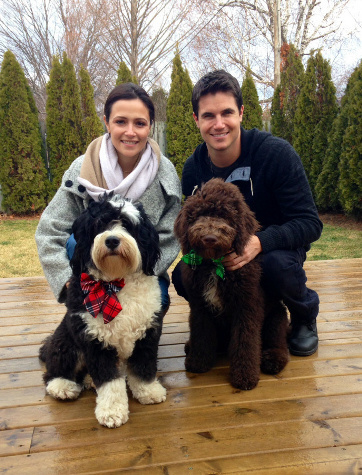 Jamie’s brother, Robbie Amell, starred in the movie The DUFF, and is also on the TV show The Flash. His fiancée, Italia Ricci, stars in Chasing Life. 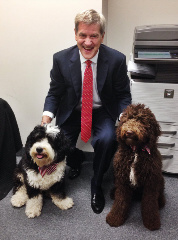 When Robbie and Italia visited recently, they graciously posed with their furry “nephews.” Here are Motley and Vedder with hockey legend Bobby Orr, and well-known hockey commentator and dog enthusiast, Don Cherry. 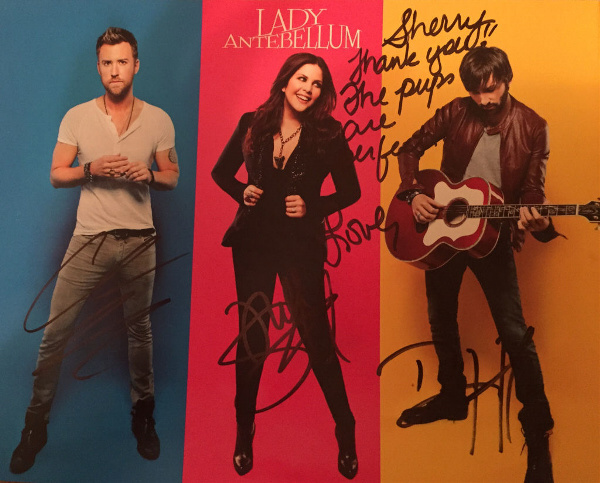 Harley, Penelope and one of Kia’s tiny Bernedoodle pups got a backstage pass to hang out with the band, Lady Antebellum. Lead singer, Hillary Scott was so impressed that she sent them home with an autographed photo.